This post was first published by The Croydonist on 03/01/2019. 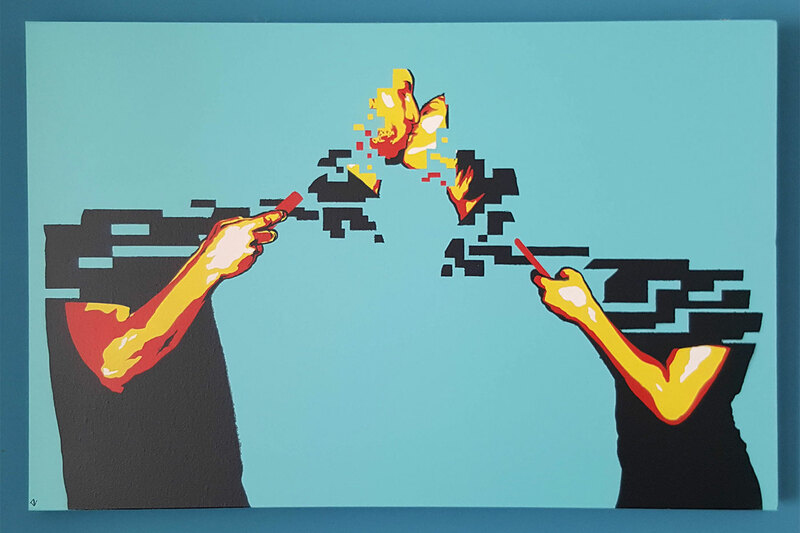 First up this year we talk to Croydon stencil artist The 3rd Man, whose vivid paintings focus on the human form. 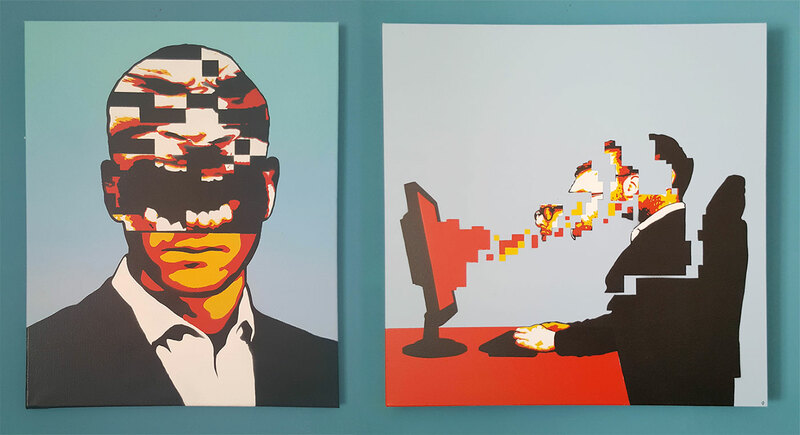 His work is predominantly canvas-based but you may have spotted a few of his mural pieces around town (in addition to being showcased on our social media headers last autumn). We find out more about the modest man and his work. Croydonist: First of all, Croydon native or convert, and what area do you call home? The 3rd Man: I’m a Croydon native. I grew up in South Croydon but I’m currently living in Addiscombe. Croydonist: Where can our readers see your work? The 3rd Man: On Instagram, @the_3rd_man and on Etsy, The3rdManPortraits. Croydonist: We know you work mostly on canvas but we hear you’ve done a few murals about town – where can we see them? 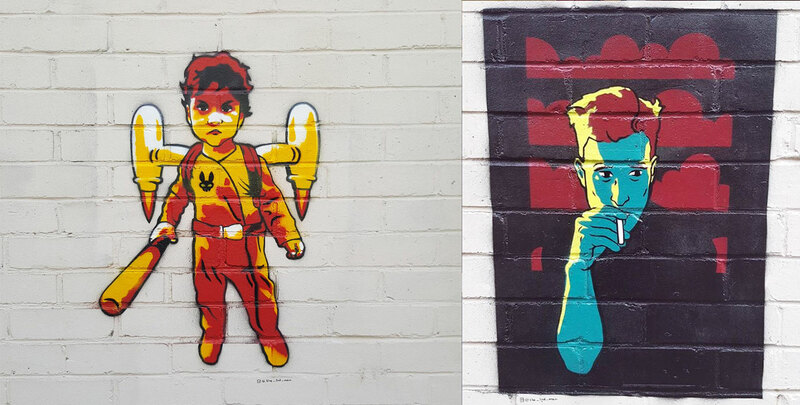 The 3rd Man: I have done a few wall stencils, a couple are on the wall outside Matthews Yard. I’ll do some more in town this year hopefully. Croydonist: You describe yourself as a stencil artist who focuses on the human form. How did you become the artist you are today? The 3rd Man: I’ve always enjoyed drawing and painting people more than anything else, and as I’ve gotten older I’ve enjoyed exploring more abstract ways of using the human form to convey an idea. I also find interesting the difference between what someone shows through their facial expression or what they say and what they are actually thinking (which is often very different) so I enjoy delving into that and finding weird and colourful ways of depicting it. Croydonist: Why the name The 3rd Man? The 3rd Man: When I was in University, two of my friends asked me to design the cover for an EP they were making. As I was the third member of the group I went by that name and just kept on using it, mainly because I like the relative anonymity. Croydonist: Where do you create your work? The 3rd Man: I design the pictures and make all the stencils in my flat and then use my Mum’s garage to do all the spraying. It’s far from ideal as she lives 40 minutes away, so I don’t get to make nearly as much as I’d like, but hopefully I’ll move to a house at some point and will be able to use my own garage. The 3rd Man: My paintings for the last few years haven’t really been about depicting a person, rather using the human form (with a lot of colour and strangeness) to make a visual representation of a feeling or idea that I’ve had. So really the person can be anyone, the pose and their expression is the more important part as far as I’m concerned. Croydonist: What’s been your most challenging commission and why? The 3rd Man: I haven’t done many commissions and what I have done are straight portraits (See my Etsy for more info! ), but of those, babies are the trickiest as they tend to all look quite similar. Croydonist: How long does a piece typically take you? The 3rd Man: The drawing and designing can vary quite a lot, my last painting took a few days to get to the stencilling stage, but one of the digitally mashed portraits was done in an afternoon. The cutting and spraying usually takes somewhere between 4 to 10 hours depending on the complexity of the design. Croydonist: What’s your process? Do you sketch work first, plot out on a computer or go straight to paint? The 3rd Man: I use a Wacom tablet, Photoshop and a mixture of drawing, photography and photo collage. I tend to do a quick and very rough sketch of what’s in my head to see if it looks right and then move on to the computer to work it all out. 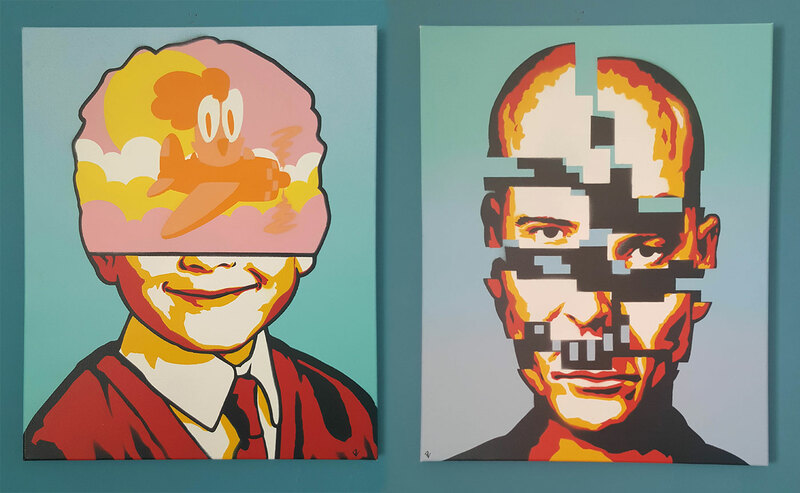 Croydonist: We particularly love your exploding heads series. Can you tell us a bit more about these? The 3rd Man: I wanted to make pictures showing the contrast between the exterior expression that someone wants you to see and the truth of what’s actually going on inside their head. As I’m slightly misanthropic they have ended up being a bit dark, but one of them is of my son which is very much a happy picture! The 3rd Man: I tend to generally think about things and then a visual representation of an idea or feeling pops into my mind and I decide to make a painting of it. This usually happens whilst on my journey to work which is why my paintings can sometimes be a bit bleak. I should get a new job really. Croydonist: Classic interview question – if you had to invite 3 artists out for a pint at your local (dead or alive) who would they be and why? The 3rd Man: That would have to be Bob and Chaz from The London Police, as they are my favourite current artists and they come across as funny and nice people. The other would be Salvidor Dali as he was the first artist I ever found an interest in, and as he was an eccentric genius I imagine his take on anything would be fascinating. The 3rd Man: I’ll keep making as many paintings as I can and keep trying to work out my aesthetic. It’s all felt a bit nebulous up until now so I’d like to focus in on a more specific idea or set of ideas. I’ll also attempt to find somewhere closer to home to do the spraying that’s also indoors. Working in a wide open garage doesn’t really help with paint drying times. It would be nice to get some work up in a gallery this year too. It would definitely be nice to see an exhibition of The 3rd Man’s work. Thanks you for chatting to us.